Oceanside Glass Tile Made From Your Recycled Bottles. Oceanside Glass Tiles are a beautiful way to add sustainable material into your commercial interior design. Oceanside Glass Tiles are handcrafted using recycled post-consumer glass bottles and silica sand, an abundant natural resource, making for a true green design. The results of this mix are amazing! See for yourself some images below. 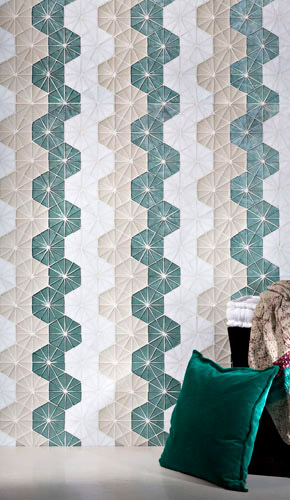 Above: Tessera Hexagon in Northern Lights Blend. 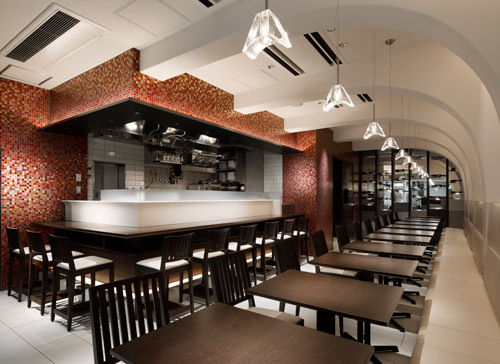 Oceanside Glass Tiles come in a variety of finishes – translucent, iridescent, and matte – and in dozens of colors. They also come in a wide range of shapes and sizes. Each batch is made-to-order which makes custom orders easy, convenient for any LEED AP designer or a commercial interior designer. 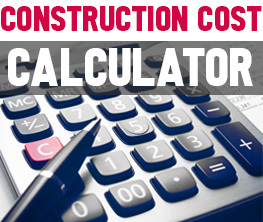 Lead time for custom designs is only 4-6 weeks. Above: Tessera Perspectives pattern in Lagoon blend. The darker colors of Oceanside Glass Tiles include a higher recycled glass content than the lighter colors. The ingredients are melted together, then ladled into iron molds to produce the tiles. The tiles are hand-cut, and the trimmings are recycled into the next batch of tiles. Above: Tessera Fez pattern in specific placement blend using Oxygen Iridescent, Oxygen Non-Iridescent, and White Non-Iridescent. Tile colors are obtained from natural earth oxide pigments. The iridescence is actually baked into the tiles, unlike many other manufacturers who just paint an iridescent coating onto their tiles. Above: Tessera 1″x1″ in Disco Inferno blend. 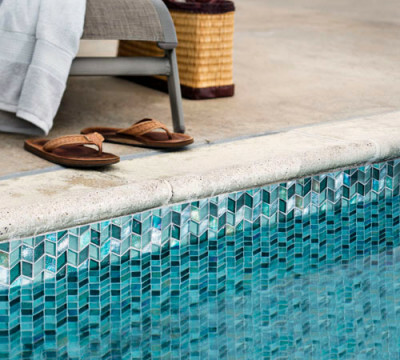 Oceanside Glass Tiles can be used indoors or outdoors. Because these tiles are very strong they can be used in bathrooms, kitchens, swimming pools, fountains, or some low-traffic flooring areas. 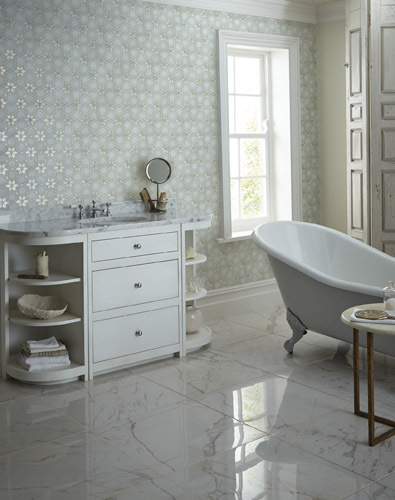 Tiles can be combined with ceramic or stone tiles to create unique green designs. These glass tiles are impervious to water. They are also heat and thaw resistant. Above: Tessera Kaleidoscope Specific Placement template E. Colors include Tide Irid, Oxygen Matte and White Non-Irid. With the great variety offered by Oceanside Glass Tiles, you can create the project of your dreams using a durable and long-lasting sustainable material. 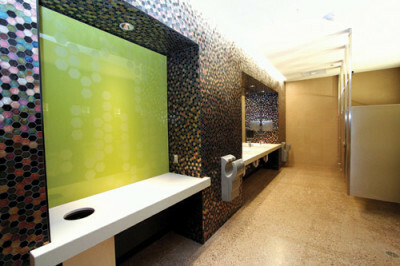 Via http://www.glasstile.com See more examples of the recycled glass tile use HERE.